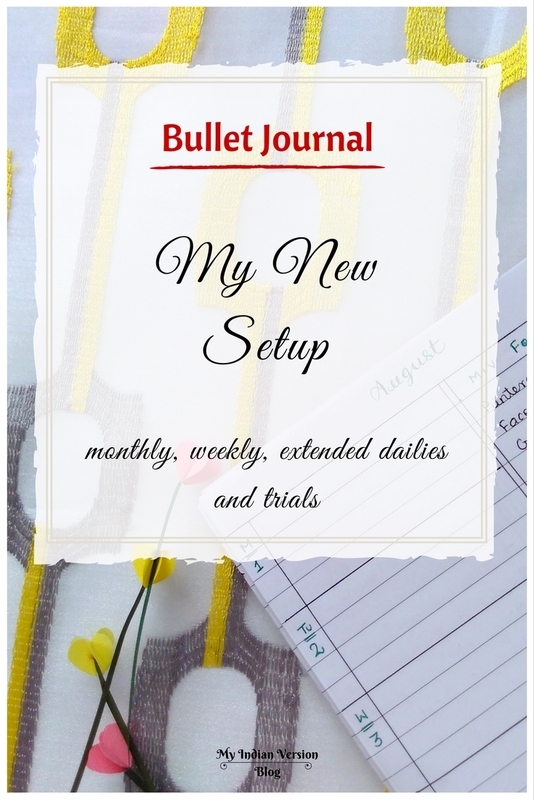 I have been using bullet journal for seven months now. And every day, I am learning new things. I have tried many ideas found on the internet. Sometimes they worked very well but sometimes they were a mess. So while trying and testing these ideas, I came up with new ideas myself. In previous posts, I have shared my weekly spread evolution, on how I started with a very basic weekly layout and kept on evolving it. 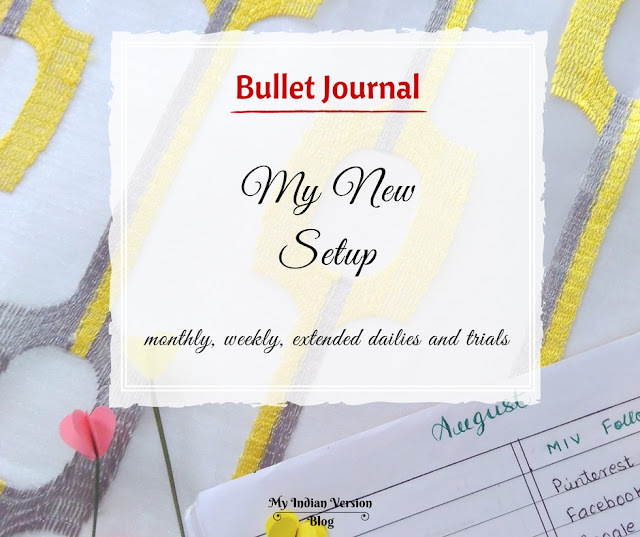 Today, I am sharing how I mix and match different ideas to plan my days, weeks, and months in my bullet journal. Also how I try new things without getting overwhelmed. So, here is a brief on how the mix and match happens! This is not how I plan my layouts every month. The layout changes according to my needs and likes. But how I plan remains same. So let's dive into the details! This month I am trying an advanced version of the original monthly log, as shared in previous monthly layouts ideas post. 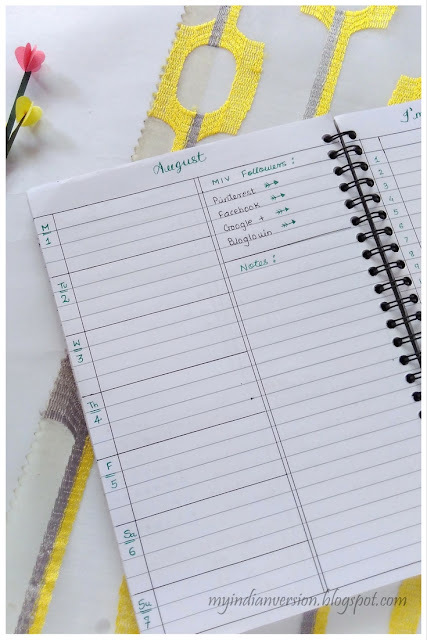 - Reminders : All the reminders like appointments, birthdays, holidays, upcoming festivals, and anything that is day-specific will be written here. - Tasks : Tasks to be done this month and any random tasks, with no specific order or date will go here. It's just a monthly brain dump! - Tracker : I have never been successful in regularly filling the dedicated monthly habit tracker. 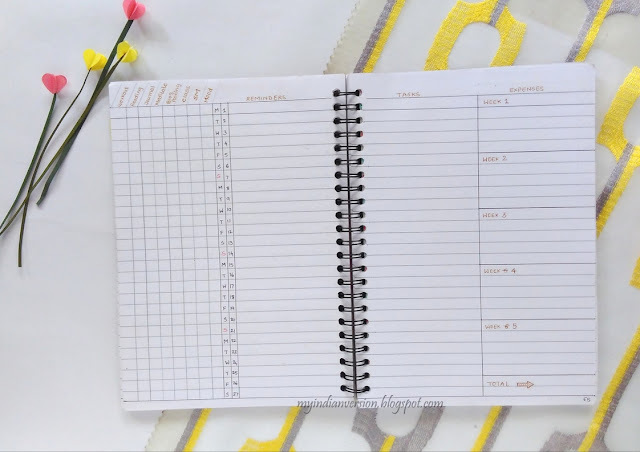 So, this time, I am integrating the habit tracker with the monthly log. Since I almost every day refer monthly log, this integration will remind me to fill the tracker regularly. Also, having few things to track, combining the monthly log and the habit tracker was easy. - Expenses : This month I will track my expenses in the monthly log and not in the weekly spread. At the end of the month, it was difficult, to sum up the expenses written in the weekly spreads. Till now, I have used the weekly spread as my dailies too. But the days when I am out or hardly have any tasks to write for the day, that space remains empty. I write quotes to fill the blank spaces, but my mind still searched for a better option. - Days : So, this time, I decided to have one-page weekly spread instead of two-page spread. Only pre-planned tasks for the week will go here. - MIV Followers : I keep track of My Indian Version's social media followers in the weekly spread. It feels so wonderful to write the increasing numbers every week! That's all I need for week-at-a-glance, now. There are NO dailies here! Here is the solution for my above problem of wasting space in the weekly spread. All my daily actions will now be written in this extended bullet journal frame. Now I don't have to worry about those blank spaces anymore! This cute frame has gone through an instant transformation to serve as my daily to-do list. 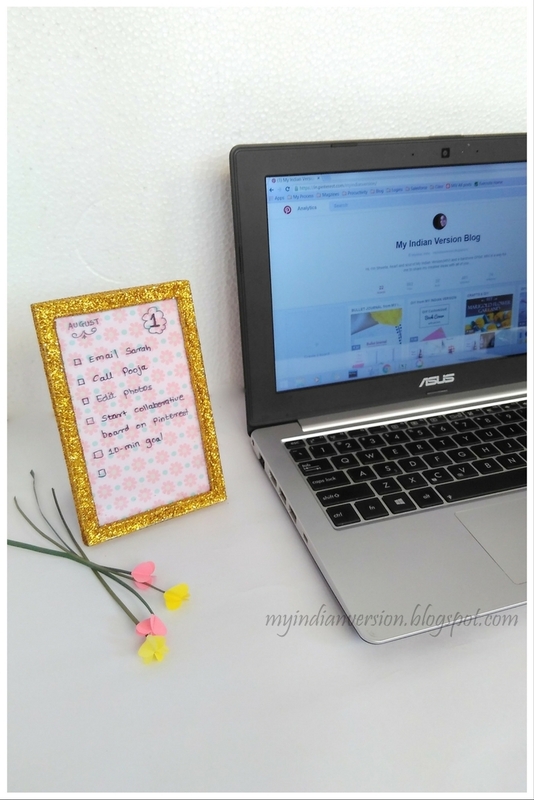 The cute, glitter frame not only help me plan by days but also is a piece of attraction on my desk. One of the most famous layouts in bullet journal community is gratitude log. 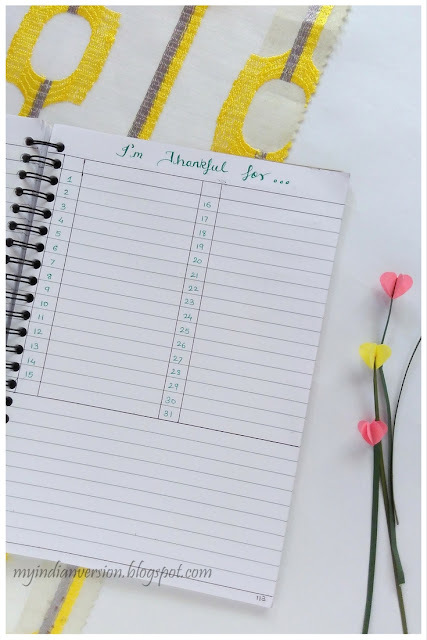 I have read, how one sentence of gratitude, each day, shifts our mind to think what's positive in our life rather than blaming what we don't have. So I thought of giving it a try. A simple gratitude log. 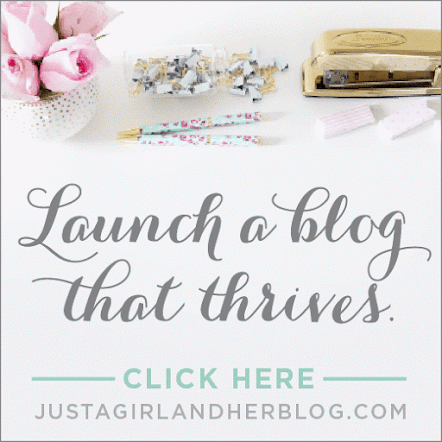 I stumbled up this interesting idea on Abby Lawson's blog. I was not sure about, how the idea will work but then I thought, its worth trying. 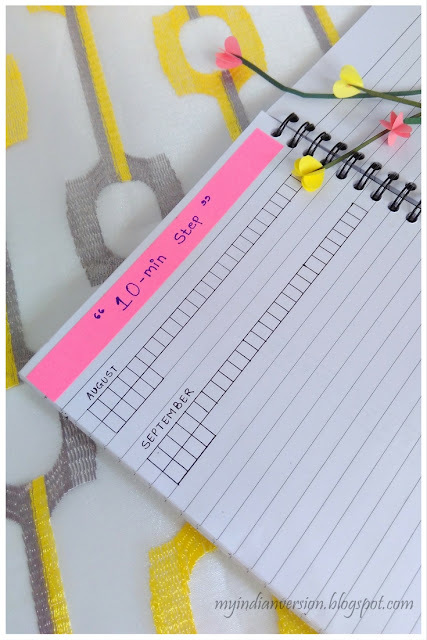 So the 10-minutes step says - just spare 10 minutes from your entire day for your 'cannot-do-it-now' goal. 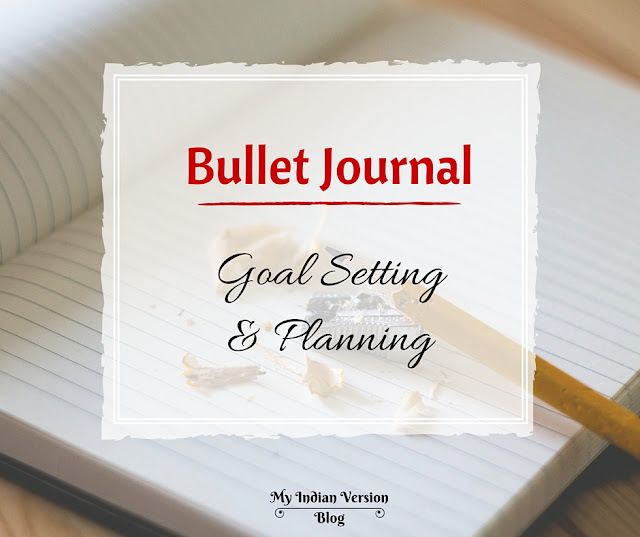 The goal can be anything, starting a blog or meditating or may be writing your favorite recipe in the recipe book. I decided to try this 10-minute step idea for re-reading Building a Framework e-book. This process of mixing and matching layouts always make me realize how flexible I can be with bullet journal. I can stay with new logs if they work, or respectfully exclude them next time. In future, if I decide to get back to writing dailies in bullet journal, I have no way to worry about it. 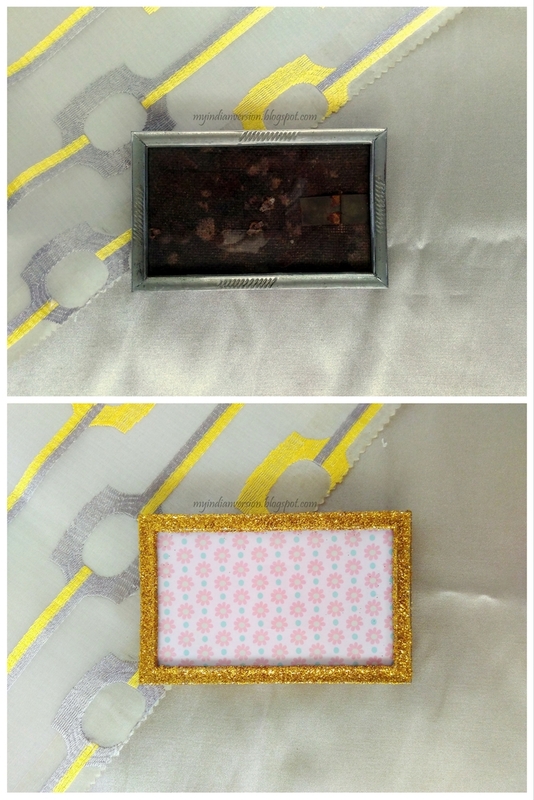 And the cute, glitter frame will still remain a part of my creative corner decor. What is that new thing you tried out this month or will try next month? Is it working for you? Tell me here. This post contains affiliate link. This means that when your click and make purchase at a site via a link I have provided, I make a small commission at NO additional cost on you. Whether or not I receive commission, I only recommend products that I personally use and genuinely recommend. 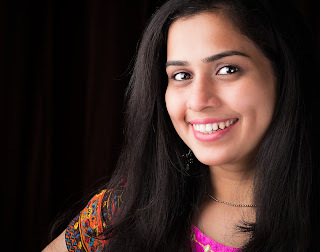 Thank you so much for supporting My Indian Version this way!